It is important to have your chimney and its liner inspected at least once a year, especially if you use it on a regular basis. Chimneys need to be checked regularly to ensure that everything is working well and that your liner is in good condition. Your liner is essentially a conduit made of clay, metal or ceramic that contains the combustion by products from your and protects the walls of the chimney from corrosion and heat. If you are new to chimney maintenance, here are a few tips to keep in mind regarding chimney efficiency and the benefits of a sturdy liner. There are many reasons that you may decide to change from using a heating oil or burning wood to a natural gas option stove or heating system. For one, natural gas can burn more completely, meaning that your furnace can be much more efficient. If you are looking to save money, natural gas rates have also come down significantly in recent years, with as much as 84 percent of natural gas on the market today produced right here at home. Plus, some utility companies offer rebates to owners who switch to gas. Still, even though there are so many advantages to getting gas, the issue, of course, is that you may have to replace your chimney liner. 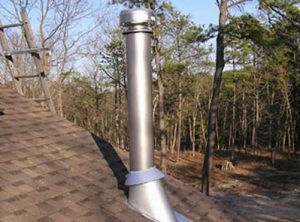 If you don’t have a liner at all, some states and municipalities require that your chimney be properly fitted with an acceptable liner to handle natural gas. This is because natural gas fumes can condense in a cool chimney, creating acidic solutions that can eat away at your brick or masonry. No matter how you decide to heat your home, it is important to know that having a clean and intact chimney liner is essential for other reasons. First of all a well-kept liner can reduce the chance of a chimney fire or carbon monoxide leak. Liners keep hot embers or noxious fumes contained, moving them through the chimney and safely away from your home. If you are looking to have your chimney inspected or your liner repaired or replaced, look no further than the professionals at Bruce’s Chimney Service. We specialize in all sorts of home, roofing and chimney repairs including chimney relining, waterproofing and more. Give us a call at 570-424-7250 today.